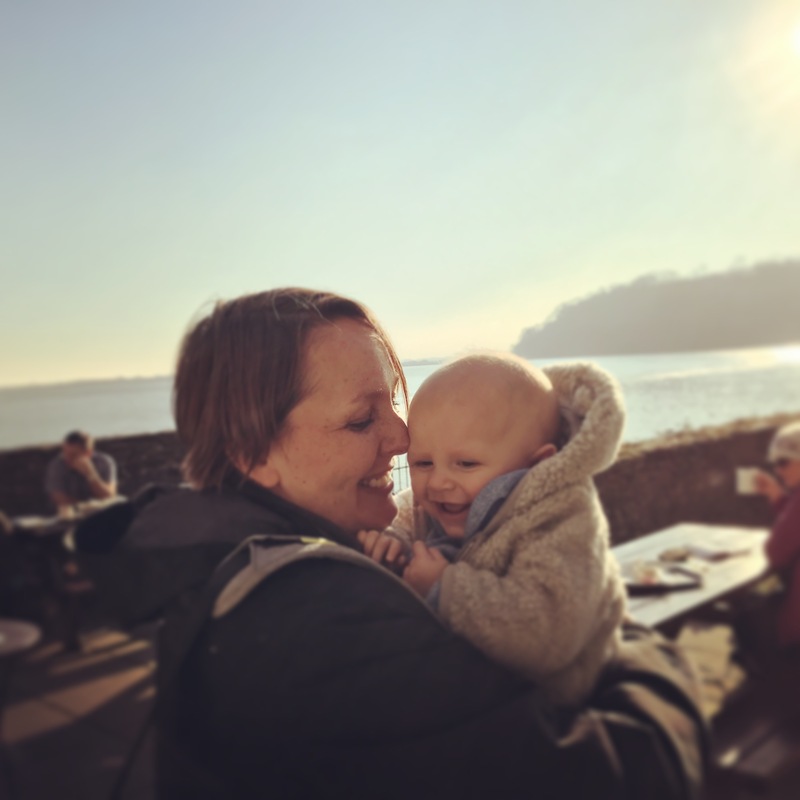 For the second week running my newborn son (well, he’s over a month old now – where has that time gone?!) has allowed me to 1) watch the Bake Off, 2) bake my week’s challenge, and 3) blog about the challenge. Now if only he’d allow me to have more than a 3 hour stretch of sleep at night and stop crying as soon as we sit down to eat dinner, life would be a lot calmer. But it’s still early days, so hopefully we’ll get there soon. Anyway, on to this week’s bake, which was for biscuits. The signature challenge was to make identical iced biscuits, and I am not artistic or patient, so that was out. The technical challenge was for viennese whirls, which I love, and the showstopper challenge was for a 3-D biscuit structure. I made one of those last year which was pretty rubbish, so easily decided to go with the viennese whirls. Viennese whirls are surprisingly easy to make: a simple mix of flour, butter, icing sugar and cornflour (the cornflour adds the short, crumbly texture to the biscuit … a similar effect can be achieved by adding custard powder to your biscuit mix). The mixture is then piped, baked and filled – classically with buttercream and jam. 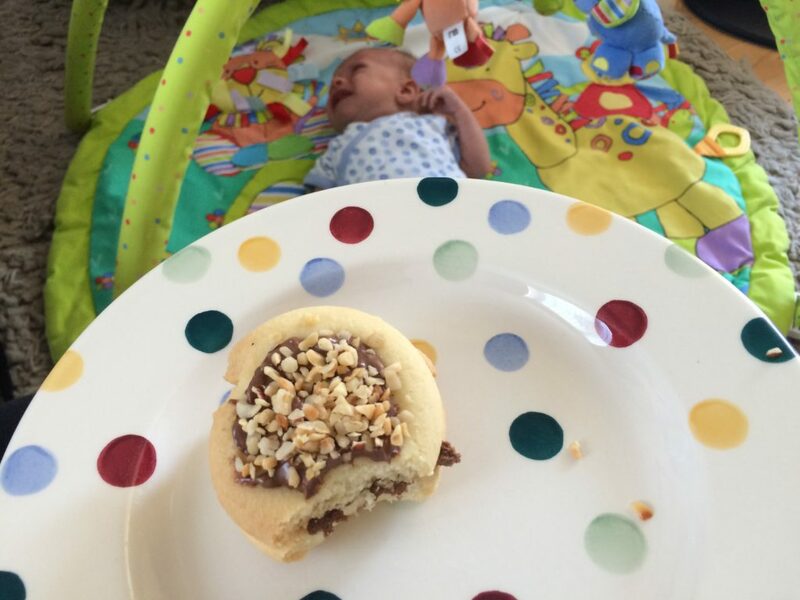 Although I don’t mind the classic buttercream and jam filling, I wanted to make something a bit different, and had two ideas in mind: a millionaire’s shortbread with caramel centre and topped with chocolate, or a chocolate hazelnut version, filled with Nutella and topped with melted chocolate and hazelnuts. I loved both ideas but as I have a huge stockpile of chocolate spread, plumped for the Nutella version. 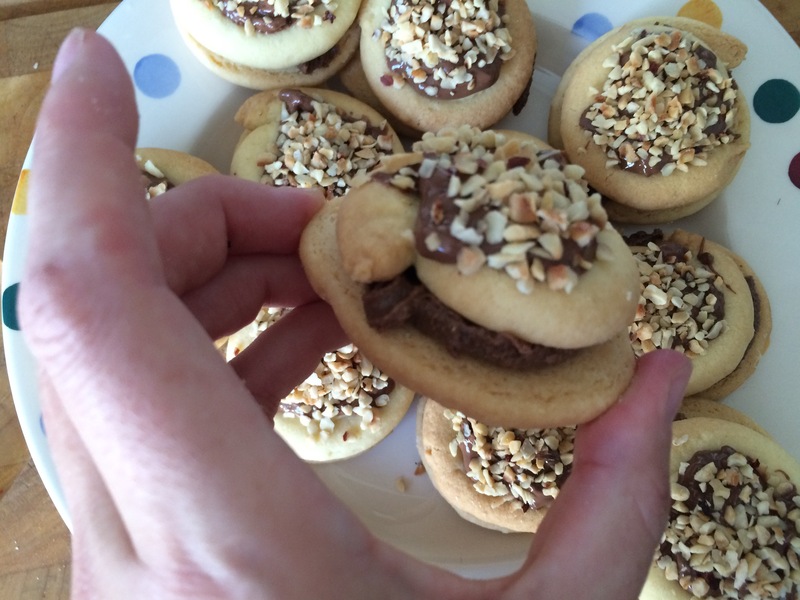 Millionaire’s shortbread Viennese whirls will be coming your way sometime soon though … after some recipe development. So, for the actual biscuit recipe, I followed this one on the BBC website. I had trouble piping my whirls as the mixture was too thick for the nozzle – an issue some of the bakers also faced. Unlike them, I gave up on the idea of beautiful piping and just took the nozzle off of the piping bag. Okay so that meant my whirls looked a touch like something out of the cat’s litter tray, but the taste was still there. Follow this recipe to make your biscuits. 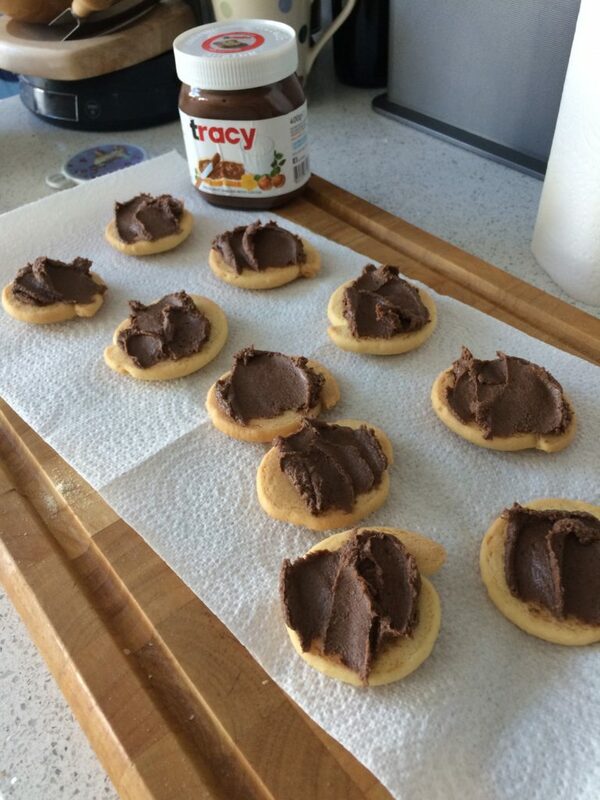 Once they have cooled, sandwich them together by spreading one side with Nutella or any other chocolate spread you fancy. 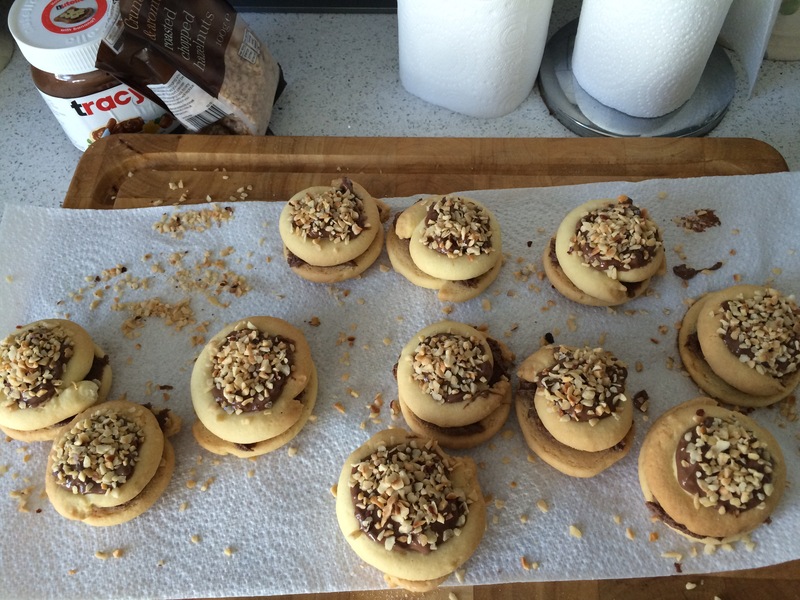 Melt the chocolate in the microwave for approximately 90 seconds (keep checking as you don’t want it to burn), and then spread it onto the top of each biscuit and sprinkle with chopped nuts. These biscuits are quite substantial, but I still managed to get through them in 3 days (with a little help from my friends). I should imagine they would keep for 5 days in an airtight tine, but I’d recommend scoffing them as soon as you can. Next week’s Bake Off focuses on bread – I couldn’t figure out from the trailer exactly what the challenges are but they look difficult, so I am not sure how successful I will be in making one of them – we’ll see! Until then, a biscuit is a good antidote to a crying baby! 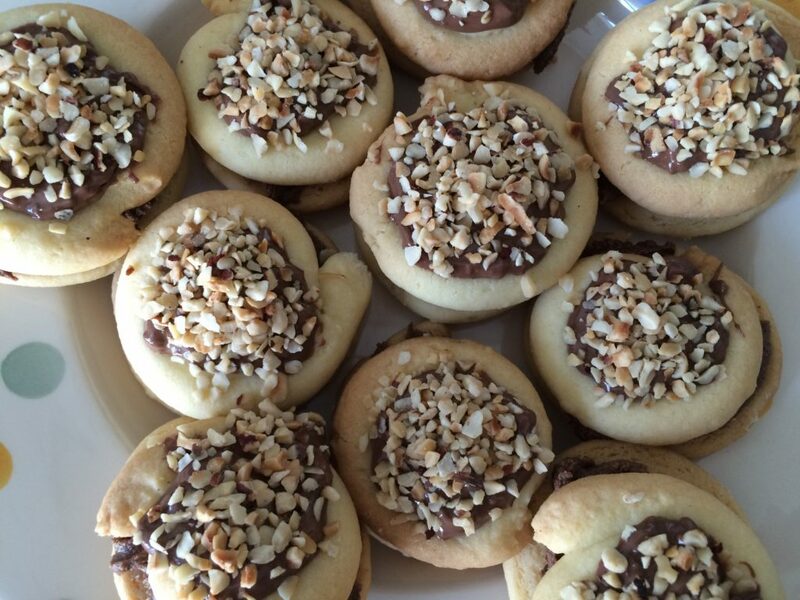 Check out all of the recipes in the link up here. I have always found them difficult to pipe, either too stiff or too soft but they always taste great. I haven’t made them for years but always went for cream and jam, not a butter cream fan. Ioan is growing fast, such a handsome little chap. I remember thinking I had fallen off the world when I first came home from hospital but within 3 months it all feels quite normal. Oh wow cream in them sounds great. 6 weeks today and it feels like no time but also forever. It’s definitely getting more manageable but my goodness it’s hard work! They might have looked a bit odd when you piped them but decorated they look great and I bet they taste amazing. Another delicious variation on the classic whirl. Love this bake off! i found them very hard to pipe too, but they do taste lovely, i would def like to try them again one day. Thanks – they sold them in Selfridges a while ago so I couldn’t resist! Aw thanks. My mum would never buy it for me as a kid as she knew even then I’d scoff the whole thing in one go! 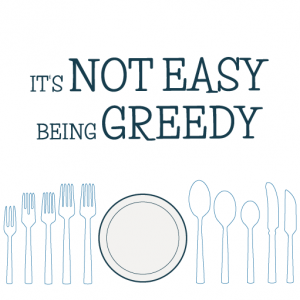 I was always greedy! Great flavour combo – it makes a lovely change to the usualy jam and buttercream. I love the sound of the Millianaires Vienesse ones too. Thanks – I am hoping to find the time to give them a whirl (hahaha). Chocolate makes everything better! 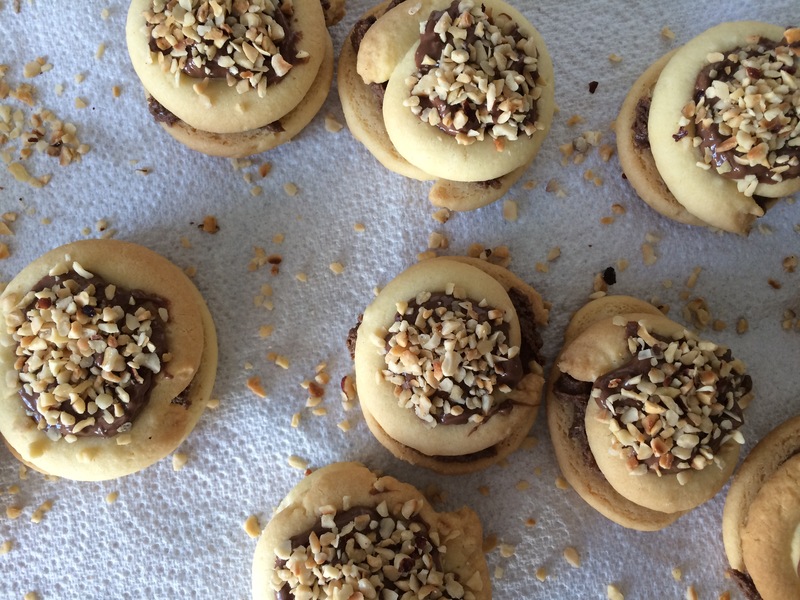 Nutella makes everything wonderful and I could eat these right now! You are right – and the taste is totally addictive! 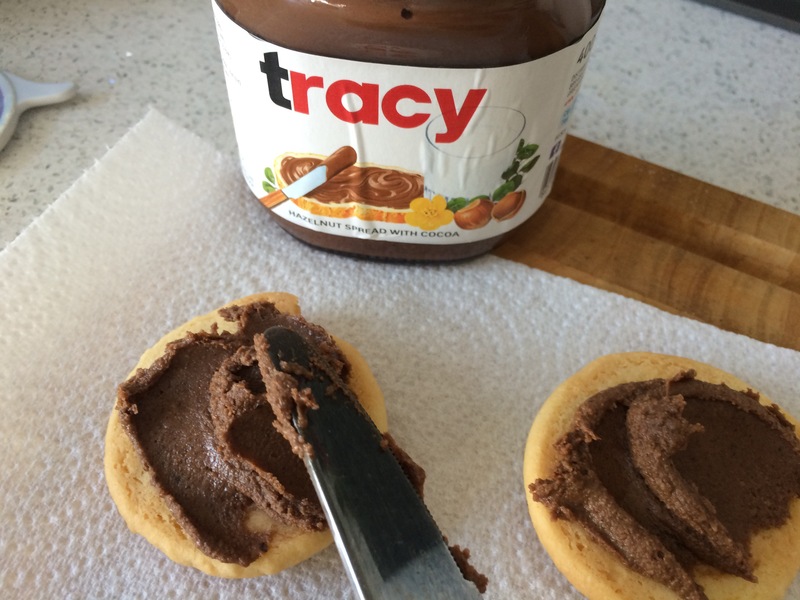 They look wonderful Tracy and I love the flavours, Nutella makes everything good! Very impressive that you managed to make them, Enjoy these moments while Ioan can’t move as there is a lot less peace to come 🙂 I can’t believe six weeks has already passed!